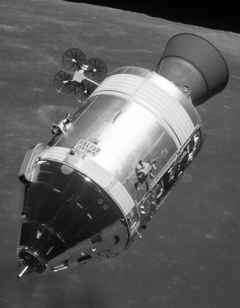 Apollo used two radio frequency ranges for communications: VHF and S-band. Originally, NASA had intended to implement the radio systems that they already had available to fulfil the disparate requirements of voice, data, television, as well as the need to track the spacecraft out to the Moon. But it soon became clear that this would involve the installation of multiple items of hardware, with severe weight penalties, and so, as far as possible, the engineers strove to implement many of these communications needs into a single system - and the result was the Unified S-band or USB system. 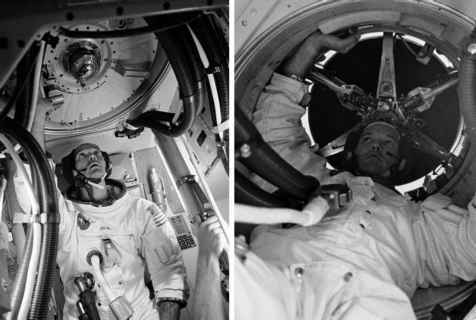 The frequencies used, above 2 GHz, were well suited to long-distance operation, but their highly directional nature made the USB system less suitable during the final stages of re-entry, and when the crew were talking between vehicles at the Moon. For this, a VHF system was added. The antennae to support these radio systems were arranged all around both spacecraft, and, for the most part, were hidden within the smooth lines of the CSM in order to preserve its streamlined shape for the ascent through the atmosphere or the later re-entry. In comparison, the LM appeared to bristle with various dishes, helixes and rods as function overcame form on a ship that needed no streamlining. The most prominent antenna on the CSM was an array of four dishes mounted on the end of an arm known as the high-gain antenna (HGA). Its mounting was articulated, and could swivel under automatic or manual control to aim at Earth. Like an adjustable torch, the array itself could be electronically configured in three ways: wide beam, medium beam and narrow beam, each focusing the antenna's pattern into a tighter beam to concentrate its ability to send and receive the USB radio signal over the large distances to which the spacecraft travelled. Endeavour, Apollo 15's CSM in lunar orbit. The four dishes of its high gain antenna are visible near the engine bell. look at the spacecraft's systems, then the telemetry had to carry much more digital data. From near lunar distances, this could only be handled by the HGA. Similarly, the high-bandwidth demands of television required this dish array when in the vicinity of the Moon. There were occasions, however, when tests were carried out to send TV or high-bandwidth data using the omnidirectional antennae and large dishes on Earth. For VHF communication, mostly to the LM, the CSM sported a pair of scimitar antennae housed in semicircular mouldings on each side of the service module. The LM had a single dish antenna for high-bandwidth communications to Earth and a pair of omnidirectional antennae mounted fore and aft. It also sprouted three VHF antennae: two mounted fore and aft for communication with the CSM and one to link the two crewmen walking outside on the lunar surface, both with each other and with mission control. It had two other antennae, but these were for radar rather than communications.